Nothin’ like getting arrested—and then bragging about it on Twitter! 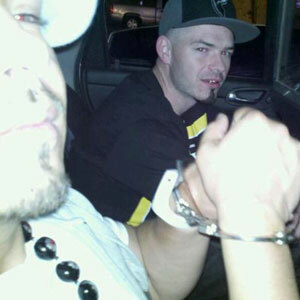 Rappers Paul Wall and Baby Bash (real names Paul Michael Slayton and Ronald Ray Bryant) found themselves in hot water on Saturday night when they were arrested for marijuana possession in a—wait for it!—drug-free zone in El Paso, TX. El Paso County Jail Records show the two were arrested at 1:30 a.m. and were released around 1:30 p.m. after posting $300 bail. They were charged with possession of marijuana in a quantity of less than 2 oz. So what did Mr. Wall have to say about the arrest on Twitter? He also posted pictures of the two of them in handcuffs in the back of the police car. Maybe they can use one of the pictures for a future album cover? Thankfully, Paul found something good in all of this: “The good news is the Texans won,” he tweeted. We sincerely look forward to a song that uses this experience as inspiration. Paaauuuulll Waaalllllllllll! Had to be super duper stupid. IF not look up every dumbass rapper and what there time served for ridiculous charges was. Tupac was the last true gangster rapper. …I wonder if he was hitting the blunt Sideways?